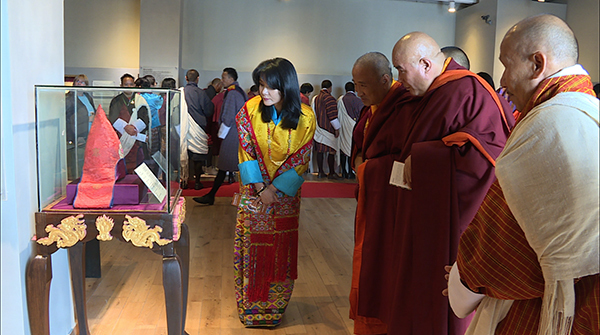 Her Majesty the Queen Mother, Sangay Choden Wangchuk graced the opening of the exhibition on “Zhabdrung Ngawang Namgyel- The Founding Father” at the Royal Textile Academy, yesterday. The exhibition, organised to celebrate the 400 years of Zhabdrung’s arrival to Bhutan, is now open to public for the next six months. Her Majesty the Queen Mother launched the two exhibition catalogues and also awarded token of appreciation to the owners who loaned the sacred artefacts for the exhibition. The artefacts belong to Zhabdrung and his successive reincarnations, Chogyel Jigme Tenzin and Chogyel Yeshey Ngodrup. The artifacts were collected from Gasa, Wangdue Phodrang and Semtokha Dzong. Some of them are private collections. An exhibition titled, “Zhabdrung Ngawang Namgyal- A Biography Through Kuthangs” was also inaugurated. The 19 Kuthangs depicting the life and legacy of Zhabdrung will be on public display for two weeks. Zhabdrung came to Bhutan in 1616. He travelled through Gasa and reached Thimphu from Lingzhi. He established Bhutan as an independent sovereign nation by unifying the country under one leadership and introduced a new system of governance. The exhibition was initiated under the personal guidance of Her Majesty, Textile Museum and Royal Textile Academy with support from the Central Monastic Body and Home Ministry.